Hydrilla (Hydrilla verticillata) is a submersed aquatic plant that forms nearly impenetrable mats of stems and leaves at the surface of the water. Originally called Florida elodea, this plant causes many problems in ponds, lakes, and rivers. • makes recreational activities such as swimming, boating, skiing, and sport fishing difficult and dangerous if not impossible. Hydrilla is native to central Africa and possibly Australia but now is found in temperate and tropical regions around the world. It apparently entered the United States as an aquarium plant, and it was sold to retail aquarium dealers across the country. In 1960 it was discovered growing wild in Florida. Hydrilla was initially misidentified because of its close resemblance to two native species of American elodea (Elodea canadensis and Elodea nutallii) as well as another exotic aquarium plant, Brazilian elodea (Egeria densa). It is a close relative of both Brazilian and American elodea. Hydrilla was well established by 1967 in several lakes in northern and central Florida and in the St. Johns River. Since that time it has spread throughout the state. Aquatic weed managers have found this new weed very difficult to control. Since its introduction in Florida, hydrilla has spread across the southern United States from the Atlantic Coast as far north as Washington, DC, across the Gulf Coast into Texas, and west into Arizona and California. Hydrilla also overwintered and grew well for several years in a pond in Iowa. It thus has the capability of becoming a serious problem in inland waters throughout most of the United States and possibly Canada. Hydrilla was first identified in North Carolina in Umstead Park (Wake County) in 1980. A survey conducted by the North Carolina Department of Agriculture in 1981 found hydrilla in 11 locations, primarily in Wake County. A multiagency survey initiated in 1989 revealed that hydrilla had spread to approximately 48 locations since 1981, and 51 locations were known by the end of 1990. About 80 percent of the confirmed infestations are in the Neuse River Basin in the vicinity of Raleigh (in Wake and surrounding counties). However, outlying infestations of hydrilla are present in Burnt Mill Creek in Wilmington, as far north as Lake Gaston on the Virginia state line, and as far west as Asheville in a small pond adjacent to the French Broad River. The explosive growth rate of this weed and its competitiveness with native vegetation makes hydrilla the most serious weed threat in North Carolina's inland waters. Figure 1. North Carolina counties that had hydrilla infestations in 1991. Small populations of hydrilla may temporarily have a desirable effect on sport fishing by providing food and habitat for forage fishes and cover for the large predators such as bass, which often lurk near the edges of the mats. The mats effectively concentrate gamefish in an easily accessible area. Hence, many fishermen believe that hydrilla improves the fishing in a lake. However, small areas of hydrilla can quickly spread into shallow backwaters, forming large mats that encroach on deeper, more open areas. Large hydrilla mats prevent access to many of the prime locations used for waterfowl hunting and most warm-water sport fishing. Low oxygen levels in these mats make them unsuitable for the growth and survival of sport fishes and most other aquatic animals. Heavy hydrilla infestations (those that cover more than 25 to 30 percent of the surface in large lakes and impoundments) eliminate fish habitat, cause stunting, and reduce the number of harvestable fish. Thus, hydrilla usually is detrimental to sport fishing over the long term. Hydrilla has caused economic problems for several states. During the 1980s, public agencies spent more than $49 million to control hydrilla in Florida alone! South Carolina's aquatic weed control expenditures grew from less than $50,000 in 1981 to $800,000 in 1989. The Tennessee Valley Authority (TVA) currently spends about $300,000 annually to control hydrilla and has spent more than $1 million since it was discovered in Guntersville Reservoir in 1982. California considers hydrilla to be the most serious threat to its water resources. Public agencies in California have spent a total of more than $15 million on hydrilla control since 1976. In Texas, more than $2 million has been expended since 1984 by state and federal agencies for hydrilla control. The cost for North Carolina's Aquatic Weed Control Program (administered by the Division of Water Resources) has increased from $10,000 in 1981 to over $60,000 in 1989. The sharp climb in expenditures of public funds nationwide directly reflects increased state efforts to manage hydrilla. These costs do not include private expenditures in locations not covered by public programs. The economic impact of hydrilla extends far beyond the spending of public funds on control measures and the immediate effects on sport fisheries and other aquatic activities. In the TVA system in September 1989, heavy late-season rainfall and consequent flood discharges caused large mats of hydrilla to break loose. These mats clogged intake screens and forced the shutdown of two hydroelectric turbines at Guntersville Dam. Hydrilla mats floated over the spillway and blocked water intakes downstream at Wheeler Dam. The result was $170,000 in lost power plant revenues. Similarly, in June 1991 the St. Stephens hydroelectric plant on Lake Marion in South Carolina was shut down because of a hydrilla accumulation on the water intake screens. A study of Orange Lake in north central Florida concluded that the economic benefits associated with the lake and surrounding properties and businesses was almost $11 million annually. During the years when hydrilla covered most of the lake, however, the benefits were almost negligible. North Carolina has approximately 550,000 acres of inland waters (that is, freshwater bodies), including ponds, lakes, and streams. Hydrilla could become established in about 75 percent of these water bodies. Many of the streams, shallow lakes, and impoundments in the Piedmont and coastal plain could be severely affected by hydrilla. Both Falls and Jordan lakes (near Raleigh) are shallow enough to support hydrilla populations in about 30 to 40 percent of their acreage, and they are close to infested lakes. Hydrilla has been present in Lake Gaston since the early 1980s. Hydrilla initially occurred only in localized portions of the upper river run area but was released from competition with Brazilian elodea during the winter drawdown of 1987-88. Since that time it has spread throughout the lake. Research suggests that about 3,000 acres of Lake Gaston is shallow enough to be colonized by hydrilla and other aquatic vegetation. Lake Norman, north of Charlotte, is a major power reservoir surrounded by valuable residential properties. The appearance of a serious hydrilla infestation at Lake Norman could have a devastating impact on property values, lake usage, and the local economy. water resources. Although the amount currently spent on hydrilla control in North Carolina is relatively small, the costs to taxpayers will continue to rise as hydrilla spreads. Many of the counties surrounding infested or susceptible lakes derive a large portion of their tax revenues from lake properties. For example, Warren County derives about one-third of its tax base from lakefront property on Lake Gaston. Any significant decrease in lake usage will cause serious economic losses to the communities and counties surrounding these water resources. Hydrilla is normally found rooted in shallow water, where it sends its long, spindly stems toward the water's surface. The roots of hydrilla are smooth, wiry, slender, and white to orange. Each stem may produce up to 15 white to brownish rhizomes at its base. The stems vary from about 1⁄20 to 1⁄8 inch in diameter and may be as long as 18 feet. Two to eight branches form at each node (joint). The internodes (the part of the stem between the nodes) are longer (often 4 inches or more) near the base of the stems and become shorter (less than 1 inch) as the stem nears the surface. Vegetative growth of hydrilla usually begins in early spring with the sprouting of tubers and turions produced during the previous season. Growth continues until the onset of cold weather in late fall or early winter. When the plant nears the surface, it branches profusely to form dense, impenetrable mats. Surface mats usually appear in July or August and persist for the remainder of the growing season, shading the bottom and preventing the growth of other submersed vegetation. Hydrilla usually does not overwinter in North Carolina in the vegetative state, but it does so further south and may be able to do so in the more southerly portions of the state (for example, Wilmington) or elsewhere during unusually mild winters. Hydrilla is well adapted to a wide range of temperatures and grows well in both soft, acidic water or hard, alkaline water. It is able to use much lower levels of carbon dioxide and sunlight than most other aquatic plants. Hydrilla begins photosynthesis before there is sufficient light for other submersed plants and continues when the carbon dioxide supply has dropped too low to be used by other plants. The depth to which hydrilla can become established and consequently the extent to which it can encroach upon deeper water-is limited by water clarity and light penetration. This depth may vary from only a few feet in turbid (murky) water to more than 30 feet in very clear water. In North Carolina hydrilla usually grows to depths of approximately 10 feet, except where erosion has produced very turbid conditions. In essentially all cases, the depth of hydrilla growth is greater than that of competing submersed plant species. Hydrilla also modifies its metabolism seasonally to tolerate the high water temperatures and high oxygen levels that exist in the surface of the submersed mats during the afternoons in midsummer. Under these conditions hydrilla can continue photosynthesis when other native and exotic (introduced) submersed plants are metabolically inactive. Consequently, hydrilla crowds out most other species of submersed vegetation. Hydrilla reproduces primarily by vegetative means, including fragmentation, rhizomes, and the production of reproductive structures called tubers and turions. These specialized structures allow hydrilla to withstand adverse conditions and to overwinter after the foliage dies at the end of the growing season. Stem fragments having only one node may form new roots and shoots within a few days after breaking from the parent plant. These new plants can grow while floating about and may root when they come into contact with the mud on the pond or lake bottom. Each plant produces many rhizomes at its base beneath the surface of the mud in which it is rooted. These rhizomes give rise to new roots and vegetative shoots, or they produce tubers. Tubers are pea-sized, comma-shaped structures that normally form at the end of a rhizome beneath the mud. The tubers are yellowish white or light brown when developing and darken to brown or nearly black with age. Tuber formation begins in late June and continues until the plants die back in late fall. The tubers break loose from the rhizomes at the end of the growing season and remain in the mud until the following spring. Dormant tubers may sprout even when they have been in dried mud for up to 10 years. Turions resemble small, scaly green peas growing in the leaf axils (the angle between the leaf and the stem). Turion formation begins in late summer and continues until the green foliage dies in the winter. Floating hydrilla mats break loose from the bottom in late fall and are blown around the water's surface. These loose mats may lodge against the bank and drop their turions, creating new infestations elsewhere in the lake. Two varieties of hydrilla are present in the United States. The hydrilla found in North Carolina has both male and female flowers on the same plant and is called monoecious. This form of hydrilla is found from North Carolina northward into Virginia and Washington, DC. The female flower is very small and inconspicuous (about 1⁄8 inch across) and is attached to the leaf axil by a short stalk (1⁄2 to 2 inches long). It has three sepals and three petals. It resembles a translucent white bubble when submerged. The male flower, which is produced in the leaf axil, breaks free and floats to the surface when mature. The mature male flower has three pinkish sepals and three white or reddish petals. The male flowers of hydrilla are not commonly recognized as flowers but appear as windrows of whitish debris floating on the water's surface. In the other form of hydrilla, the dioecious type, the male and female flowers grow on separate plants, but only the female plants have been found in the United States. Dioecious hydrilla is present in Florida and elsewhere in the country outside the known range of the monoecious form. It has been suggested that the hydrilla in Burnt Mill Creek in Wilmington is of the dioecious variety (that is, the Florida type). The female flower of dioecious hydrilla is identical to that of the monoecious plant. Flowering of hydrilla in North Carolina usually begins in summer and continues into late fall. The timing seems to vary rather widely with location. Seed formation does occur in field populations of monoecious hydrilla, but its importance for reproduction is not known. Figure 2. A hydrilla plant. Figure 3. 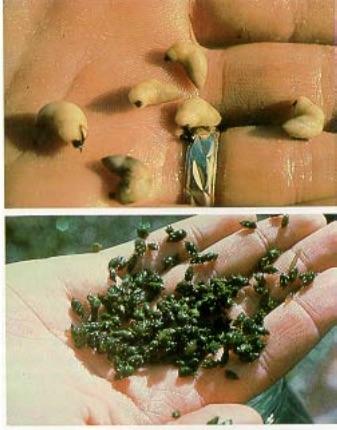 Hydrilla tubers (above) and turions (below). Photos by W. T. Haller, University of Florida. Figure 4. Hydrilla plants with female flowers. Hydrilla is very similar in appearance to its close relatives, American and Brazilian elodea, and often is misidentified as one of these species. A number of characteristics can be used to distinguish hydrilla from these related species. The most certain way of distinguishing hydrilla from American and Brazilian elodea is its floral characteristics. The male flowers of American and Brazilian elodea are readily distinguishable from those of monoecious hydrilla because they are larger and remain attached to the parent plants on stalks rather than floating free on the surface. Also, the male flower of Brazilian elodea is opaque white and much more showy than that of hydrilla. 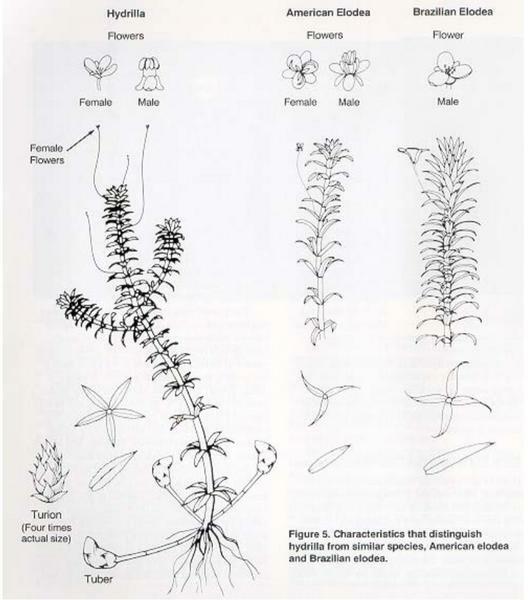 No female flowers are present on populations of Brazilian elodea in the United States. Another characteristic of hydrilla that clearly distinguishes it from similar species is the development of tubers and turions. New tubers may be found during the growing season still attached to the ends of the rhizomes. Early in the season when no plants are visible or before tubers begin to form on the new growth, tubers can be found by digging up some of the mud where the plants were growing the previous year and sieving it through a piece of coarse screen. Neither American nor Brazilian elodea produces tubers or turions. The general robustness of the plants sometimes has been used to distinguish hydrilla from similar species. American elodea is usually much smaller than hydrilla or Brazilian elodea. Its leaves occur in whorls of three in comparison to whorls of three to six (usually five) in Hydrilla and four or eight (usually four) in Brazilian elodea. Brazilian elodea is usually the largest of the three species and usually appears bushier because the leaves are longer and closer together. These characteristics vary widely with environmental conditions, however, and are not always very reliable means of identification. The leaves of hydrilla usually have fairly prominent teeth along the margins and may have recurved spines along the underside of the midrib (common in the dioecious, or Florida, variety but rare in the monoecious variety), giving the plant a rough texture when it is drawn through the hand. Both American and Brazilian elodea lack the spines on the midrib, usually have much smaller and more numerous marginal teeth, and generally do not feel as rough as hydrilla. The presence and extent of development of the marginal teeth and spines on the midrib of hydrilla leaves vary somewhat with location, age of the plant, and position of the leaf on the stem. These features may also be influenced somewhat by water and sediment quality. Older plants often feel rougher than younger plants because the teeth and spines are more developed. Hydrilla growing in some lakes or portions of an individual lake may have poor tooth and spine development and feel relatively smooth. Plants growing in hard, alkaline water often have well developed teeth and spines as well as external mineral deposits (marl) and may feel rougher than plants taken from very soft waters. (Most inland surface waters in North Carolina are very soft and many are acidic.) Consequently, rough texture and the development of teeth and spines, although often cited as a way of distinguishing hydrilla from its look- alike relatives, are not very reliable means of identification. Figure 5. Characteristics that distinguish hydrilla from similar species, American elodea and Brazilian elodea. Hydrilla is spread primarily by human activities. Fragments can be spread from one body of water to another when people do not remove weeds or weed fragments from boat motors and trailers or from live wells and bait containers. It may also occur when they dump aquaria into ponds and streams. Hydrilla is also sometimes intentionally introduced as a source of water plants for the aquarium industry or by fishermen hoping to improve fishing in their favorite lakes. Weed control operations sometimes unintentionally spread hydrilla. Earth-moving equipment such as draglines and backhoes used in ditches and around the edges of infested ponds and lakes as well as bulldozers used to renovate exposed lake beds may spread the tubers and vegetative fragments to new locations. The flow of water in streams and the currents generated by wind and wave action in lakes can carry vegetative fragments downstream or into uninfected areas where they may take root and grow into new plants in only a few days. The extent to which hydrilla is spread by animals is uncertain. Hydrilla fragments may be transported over short distances on the legs, fur, and feathers of aquatic mammals and waterfowl feeding and resting in infested areas. Tubers, turions, and vegetative fragments of hydrilla eaten by these animals will not grow after passing through the digestive tract and therefore do not present a problem. Undigested tubers and turions regurgitated from the crops of migratory waterfowl or removed by hunters and wild predators may sprout and thus can spread hydrilla over long distances. Because of the harmful economic and environmental effects of hydrilla, it pays to initiate control measures as soon as an infestation is discovered. Any effective hydrilla control program must be timed to attack the weed at critical times in its growth cycle when it is most susceptible. 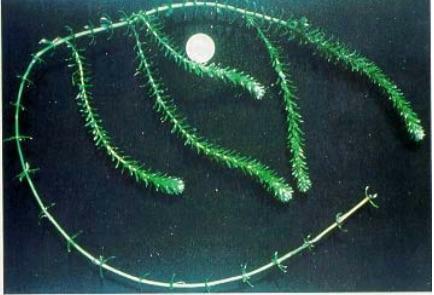 Physical, mechanical, biological, and chemical techniques can be used to control hydrilla. Physical control (also sometimes called cultural control) is a matter of changing the habitat in ways that discourage weed growth. Changing the water level (by drawdowns), introducing pond dyes, and placing fabrics on the pond or lake bottom to block sunlight and prevent weed growth are examples of physical control techniques. Winter drawdowns, which are so effective in controlling many submersed weeds such as Brazilian elodea, have not proven successful with hydrilla. The tubers and turions in the mud readily withstand the effects of drying and exposure during the drawdown. In fact, a drawdown may stimulate the sprouting of dormant tubers when the pond or lake is refilled. Once a sprouted shoot has been killed, however, the tuber from which it grew will not resprout. This may be an advantage if the drawdown is combined with application of a granular herbicide to the exposed mud. (Casoron or Norosac may give fair control, provided that there is relatively little current to wash the herbicide away from the treated area.) This approach may also work if herbicides are applied during the subsequent growing season to kill regrowth before the plants form new tubers and turions. A winter drawdown without an associated herbicide treatment is generally ineffective for hydrilla. Certain fabrics (such as Texel, Aquascreen, and Bottom Line) have been designed for use as barriers to be placed over the pond or lake bottom. These fabrics block sunlight and prevent the establishment and growth of submersed weeds such as hydrilla. Usually called benthic barriers, these fabrics may be effective in small areas for a limited period of time. However, they are extremely expensive (cost may be as much as $10,000 per acre), and they must be removed and cleaned periodically. Because of their high cost, their use is rarely warranted. Registered pond dyes such as Aquashade may provide partial control in small ponds from which there is little or no outflow during the growing season. Hydrilla requires treatment at 2 parts per million (ppm), which is equivalent to 2 gallons of Aquashade per surface acre in a pond averaging 4 feet in depth. Because Aquashade is ineffective in water less than 2 feet deep, some weed growth will occur in the shallower marginal areas. Pond dyes are ineffective in open lakes or streams where substantial water exchange would dilute the dye. Mechanical control involves the use of hand labor (for example, raking and seining) or machinery to remove the vegetation from a body of water. Mechanical control of hydrilla provides only temporary relief and may spread the weeds to other areas of the lake or waterway by releasing vegetative fragments. The use of draglines and backhoes, dredging, or specialized mechanical harvesters may be effective for temporary maintenance of access channels but is very expensive and does not provide permanent control. It may also result in the transport of tubers in the mud that clings to the equipment. Our reservoir bottoms are characterized by uneven terrain and the presence of stumps and boulders. Access limitations, shallowness of the water, and obstructions in the infested areas frequently prevent the use of mechanical control. Disposal of the harvested vegetation is also a costly problem. Mechanical control may be warranted in some circumstances when herbicides or other more cost effective methods cannot be used (for example, in the vicinity of a drinking water intake), provided that access and obstructions are not problems. Triploid sterile grass carp (Ctenopharyngodon idella) have been used extensively in North Carolina and many other states to control hydrilla and other submersed aquatic weeds. Grass carp may live as long as 10 years and are usually very effective in suppressing hydrilla in ponds and small lakes, particularly if the fish are stocked in the fall. Their longevity makes grass carp very attractive alternatives to expensive herbicides, in spite of their seemingly high cost (about $7 per fish). Grass carp also eat hydrilla in preference to many other submersed plant species and usually do not feed extensively on desirable emergent vegetation such as arrowhead and bulrushes. Grass carp are generally stocked in ponds at 10 to 15 fish per acre. For larger impoundments, fish should be stocked at 20 fish per vegetated acre. A permit from the Wildlife Resources Commission (919-733-3633) is required if the pond is larger than 10 acres or if the owner plans to stock more than 150 fish in the same body of water. Only the triploid sterile fish may be introduced into North Carolina waters, and these may be stocked only in relatively small impoundments where the fish can be contained readily. This limitation stems from concern about the impacts that escaped fish could have on fisheries and waterfowl habitats in public waters and on marine fisheries and shellfish habitats downstream. Policies on stocking of grass carp in large lakes and reservoirs in North Carolina and elsewhere can be expected to change as we gain more information about their impact on large systems and downstream resources. No other organisms are currently available for biological control of hydrilla in North Carolina. The progress of recent research in Florida indicates that one or more species of insects (including two species of flies, a tuber weevil, and a stem- boring weevil) may prove effective on hydrilla. The North Carolina Department of Agriculture has shown interest in these insects and others for hydrilla control in North Carolina. One or more of these insects may be available in the future. Five aquatic herbicides are currently registered for control of hydrilla in North Carolina. These include copper (copper sulfate and organic copper complexes), diquat, endothall (Aquathol and Hydrothol formulations), and fluridone (Sonar). Copper is generally used in combination with either diquat or endothall, but alone may give fair control of hydrilla at application rates of about 3 ppm. Copper is very toxic to fish at this rate when applied to the soft waters characteristically found throughout most of North Carolina. Consequently, copper is usually not recommended for hydrilla control except when tank mixed with other herbicides. The fifth herbicide, dichlobenil (Casoron and Norosac) is used to a lesser extent, generally in association with a winter drawdown. Each of these herbicides is manufactured in one or more formulations that are used under different circumstances. Herbicides for hydrilla control (with the exception of dichlobenil) should be applied when the vegetation is actively growing, usually in spring or early summer well after the tubers and turions have sprouted and the new shoots have emerged from the mud. 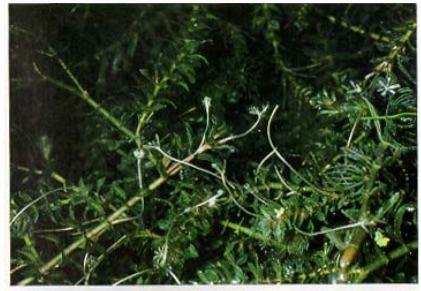 Properly applied, these herbicides may be used to control hydrilla selectively among other species of vegetation. The degree of selectivity depends on the herbicide used, application rate, timing, method of application, contact time, and the other species present. Both diquat and endothall are fast-acting contact herbicides that can be used to control hydrilla and a wide range of submersed species by using weighted trailing hoses to inject the liquid formulations beneath floating plants such as spadderdock (Nuphar spp.) or around emergent plants such as bulrushes (Scirpus spp.). Granular endothall formulations can be used in a similar way. Certain species of desirable native vegetation such as American eelgrass (Vallisneria spp.) are tolerant to endothall at normal application rates. Similarly, fluridone may be used in large lakes with minimal long-term impacts on desirable native vegetation, especially many emergent species that are tolerant to fluridone at the application rates used for hydrilla control. Applying the correct herbicide at the proper time and rate will control target weeds with minimal impact on nontarget species or the environment outside the treated area. Herbicides at best represent only temporary and often expensive solutions to the Hydrilla problem. Hydrilla control with herbicides may cost more than $500 per acre per application, and repeated applications may be needed during the same or subsequent growing seasons. In large lake systems it is not economically feasible to eradicate hydrilla by treating the whole lake with herbicides or other control methods. Usually, this means learning to live with hydrilla and using herbicides or other weed control techniques only when necessary to keep boat access areas and traffic channels open. The extent to which herbicides and other control techniques are used is usually dictated by the economic value of a particular body of water. In certain cases, herbicides cannot be used at all because of environmental conditions (for example, in rapidly flowing water), water use restrictions (for example, proximity to a domestic water supply intake), and obstructions that may prevent the use of spray equipment. In these circumstances, other methods of control must be used. All precautions specified on the labels should be observed when using aquatic herbicides. When handled and used properly, aquatic herbicides pose a minimal threat to humans, fish, wildlife, or the environment in general. However, the concentrates that come directly out of the original containers and diluted materials in the spray tank may be severe skin or eye irritants (as in case of endothall formulations), and some may be toxic or corrosive (for example, diquat) if accidentally ingested or allowed to come into contact with the skin or eyes. Always wear gloves, goggles, and protective clothing when handling and applying herbicides. In case of eye or skin contact or irritation, stop application immediately and flush affected areas with clear water. Obtain medical attention. If you accidentally ingest herbicide or if you experience headache, nausea, dizziness, or other symptoms of possible poisoning, seek medical attention immediately. None of the aquatic herbicides labeled for use in North Carolina are classified as restricted use herbicides. Consequently, they may be purchased by individuals for use on their own property without obtaining a license. However, aquatic herbicides may be applied to public waters or to multi-owner ponds and lakes only by qualified, licensed aquatic applicators. Only those herbicides whose labels state that they are for aquatic use should ever be applied to plants in the water. Specific information on application rates and the relative effectiveness of herbicides may be found in the aquatic weed section of the North Carolina Agricultural Chemicals Manual published annually by the College of Agriculture and Life Sciences at North Carolina State University. Additional information may be obtained from your county Cooperative Extension Service office. Do not introduce any aquatic plant into North Carolina waters. Remove and destroy all plant fragments on motors and trailers, inside boats, in live wells, and it bait containers, especially after they have been used in waters that are infested with hydrilla. Thoroughly clean all equipment and vehicles used in hydrilla-infested waters, including those used for maintenance and management operations when the water level is low and the lake or pond bottom is exposed. Watch for hydrilla in lakes or streams you visit and report any new hydrilla infestations that you find. Whenever you suspect that you have found hydrilla, report it immediately to the proper authorities. The Cooperative Extension Service office in your county can help you make a positive identification of this weed. (Consult the local telephone directory for the number under county listings.) Report new infestations to the Aquatic Weed Control Program in the Division of Water Resources, North Carolina Department of Environment, Health, and Natural Resources in Raleigh (919-733-4064), to the North Carolina Cooperative Extension Service, or to a Wildlife Enforcement Officer or other agent of the North Carolina Wildlife Resources Commission. Tell them where you found the plant and how you can be contacted if further information is needed. If hydrilla is found on your own property, undertake control measures as soon as possible.